When the nine-day meeting concluded, the traditional Masonic forms of platitudes and self-congratulations were recorded along with some changes in the way Freemasonry had worked until that time. The convention introduced the idea of dues cards, initiation fees prior to degrees, established suspension for non-payment of dues, and some uniformity of work was adopted. The last thing Freemasonry did at that convention was to chamber one final change in protocol, and in doing so shot itself in the foot. Freemasonry has still not fully recovered from that self-inflicted wound. Notwithstanding the idea was not even binding on American Freemasonry, that foot wound ultimately crippled every jurisdiction in the United States until 1987. Today, twenty-four jurisdictions continue to allow that wound to remain untreated. Interestingly, Kentucky was one of seven jurisdictions that chose not to participate in the Baltimore Convention and sent no representatives, yet adopted the recommendations. 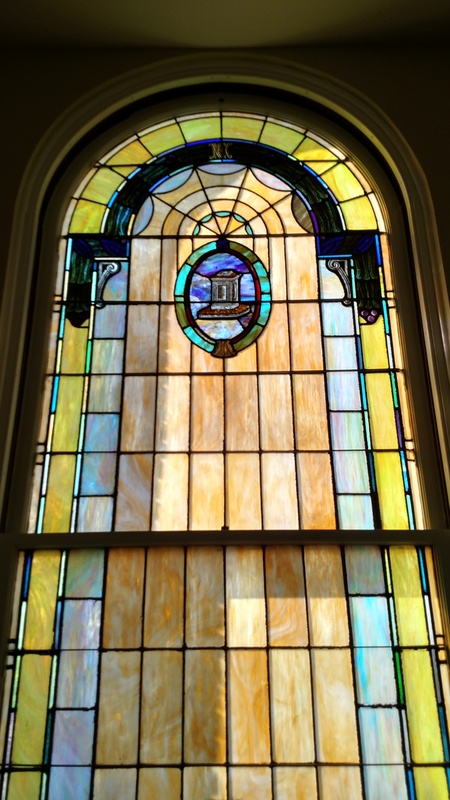 5 The practice continues today in the Commonwealth and hinders – some believe cripple, Freemasonry in Kentucky. Multiple attempts to change this practice in Kentucky have been made to no avail. One hundred, and seventy-three years later, twenty-four Grand Lodge jurisdictions in the United States carry forward this practice as the era of declining membership, shrinking lodge attendance and involvement continue. 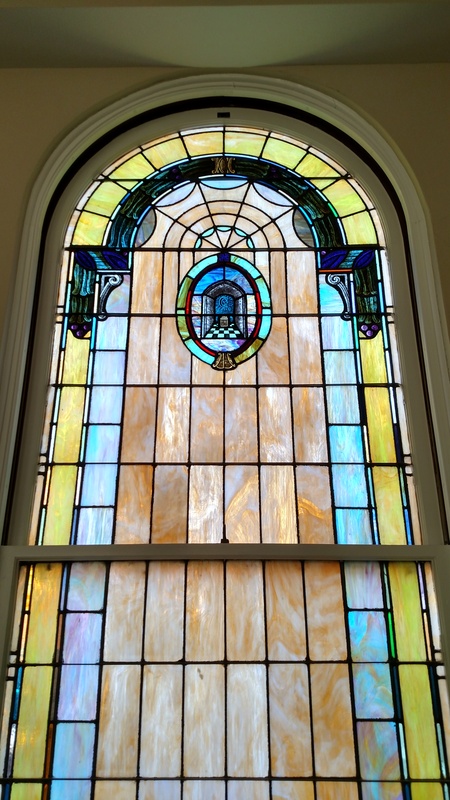 Since 1987, twenty-six other Grand Lodge jurisdictions have rejected the idea that opening and doing business in any degree below Master Mason is an “impropriety,” and have restored the tradition of opening and doing business on the Entered Apprentice degree practiced for 126 years before the 1843 convention. The first Grand Lodge rejecting the practice was Connecticut in 1987. Missouri, the jurisdiction that put forth the idea in the first place, followed in 1994. By 2016, twenty-four more states returned to the tradition and began the long process of recovery and healing from that self ­inflicted wound. “That’s the way we’ve always done it” is finally true, but only if we fail to consider what was practiced before 1843. Many Masons today simply point to the Baltimore Convention as the reason the practice changed, as if that is all that is necessary to explain why we close the door on new brothers until they are raised. Many of the same Masons are surprised to learn how an event that took place 23 years before the convention haunted Freemasonry in America to the extent that changing the practice seemed like a good idea at the time. To best understand why Freemasonry chose to prevent its youngest votaries from attending lodge one must look at the events in context that led to the practice viewing those events through the perspective of the period in which it unfolded. On September 11, 1826, William Morgan was taken from the Ontario County jail near Batavia, New York, forced into a carriage by several men, and was never heard from again. Many accounts of what came to be known as the “Morgan Affair” deal with it as if the case were clear, concise, backed with irrefutable evidence and airtight. Still, there are other accounts that highlight the circumstantial evidence suggesting there’s room for doubt. Morgan, supposedly a Freemason, committed the transgression of having written an expose about the fraternity and its ceremonies and ritual that was about to be published. As result of Morgan’s disappearance, a wave of claims of illegal and immoral allegations were levied against Freemasonry. Masons were accused of subverting political and religious institutions, and corrupting the criminal justice branch of government. Women and the church joined against Freemasonry, and the call for the abolishment of the fraternity turned into an anthem that lasted well into the next decade. Anti-Masonry spread into all the states – denouncing first the system and then the men, as unfit for any office, and unworthy of any countenance. Not only were men who were Masons denounced, but also denounced were those who would not denounce them. The number of Masons in the United States during the acknowledged hay-day of the anti-Masonry hysteria dropped from 100,000 to 40,000. Since the days of Benjamin Franklin’s Freemasonry, lodges were opened and did their business on the Entered Apprentice degree. Following the anti-Masonic hysteria emerging from the Morgan Affair, paranoia about initiates becoming members, learning passwords, grips and private parts of Masonic ceremony, and then leaving the fraternity and exposing them publically played a role in the attitude of many attending the 1843 Baltimore Convention. Morgan’s expose was published anyway after his disappearance. The anti-Masonic political party that evolved from the mass hysteria had run its course by 1838, but those twelve years left Freemasonry wounded and stinging well into the 1840s. The ghost of William Morgan continues to exact a lasting revenge as result of the actions of certain misguided Batavian Masons in 1826. The adoption of the clouded notion, that by precluding Entered Apprentices and Fellow Crafts from our meetings throughout the country, and curtailing the opportunity to best assure their early integration and inclusion into our professed world of fellowship, is Morgan’s lasting revenge. Today, every lodge in those remaining twenty­four jurisdictions in the United States that continue to practice what was created at the Baltimore Convention is haunted by the ghost of William Morgan whether they realize it or not. His revenge has been much more damaging than the exposure he wrote – an expose that most Masons today do not even know exist. Opening and doing business on the Master Mason degree is clearly not the way we’ve always done it. It’s not even the way over half of the jurisdictions in this country do it today. The twenty-six Grand Lodge jurisdictions that are not haunted by Morgan’s ghost report no research to illustrate how opening and doing business on the first degree has helped retain or successfully integrate new brothers into the fraternity before they are raised. They should not be expected to have such data. We should have enough common sense as Masons to realize how practicing what we profess to do in our fraternity offers all the substantive data we need. Many Masons in jurisdictions continuing to cling to this tired and regressive practice often express their view that that opening lodge in anything but the Master Mason degree and allowing anyone but Master Masons in lodge for business somehow lessens the significance the Craft. This thinking is completely out of step with this era of Freemasonry. Exposes written by men who may have posed as Freemasons or became Masons with the intent of publishing its rituals and ceremonies was a concern of Freemasonry at one time. It is very difficult to believe today, when the Internet offers much more than any previous publication ever did, and that opening and doing business on the Master Mason degree somehow prevents any such disclosures. The notion or claim this outdated practice has a constructive purpose today demonstrates how little many Masons understand why the practice was adopted in the first place. Ignoring the effects of this regressive practice unnecessarily impedes the constructive evolution of the fraternity. When there is an effective guard on the West Gate, consistent use of dues cards as intended, and correct practice of the process of due trial and strict examination of visitors in place, there’s simply no justifiable reason to continue doing that which long outlived its proposed purpose. It should be evident that precluding men who seek fellowship and more Light from our lodges no matter the level of their degree, is not in the best interest of Freemasonry today. Returning to the practice of opening lodge and doing business on the Entered Apprentice degree helps bring an end to the 163 year old haunting and vengeful reign of William Morgan’s ghost. It would seem a remote possibility that anyone or, in this case an organization, would shoot themselves in the foot a second time. Some believe, however, that is exactly what has happened in Freemasonry. Our standards for entry have been watered down in anxious attempts to boost membership. Less of a premium is placed on ritual proficiency. The West Gate has not been guarded with consistency – in some cases looks as though it has been left unattended. Our feasts and stabs at fellowship gathering appear to be reduced to fish fry outings as our work to provide wholesome instruction, maintain our facilities, appearance and protocols continue to disintegrate. Fortunately, throughout the nation, many Freemasons have and continue to labor in removing bullets from cocked guns so as to prevent future self-inflicted wounds. The twenty-six jurisdictions that allow lodge to be opened and business conducted on the Entered Apprentice Degree are healing from the 1843 shot in the foot. Hopefully, the other twenty-four will see the Light from the wisdom in doing the same. John Bizzack, Lexington Lodge No. 1, Lexington, Kentucky. and Lexington Lodge No. 1 in April 2016. 1 “Batavia to Baltimore and Beyond” by Stephen Dafoe, Heredom, Vol. 15, 2007. 2 The Convention that Changed Freemasonry, Mack Sigmon, Grand Lecturer, Secretary, Board of Custodians, Wilkerson College Lodge, North Carolina, 2011. 3 Putting Masons Back in Masonry, L. Todd Eastham, Past Grand Master, Grand Lodge of Kentucky, Unpublished Paper, 2016. 4 Note from Eastham paper: “Innovation differs from improvement in that innovation refers to the notion of doing something different, rather than doing the same thing better, or can be interpreted as a change, alteration, or modification to the existing “body of Masonry”, which is mainly centered around our structure, organization, and ancient usages and custom. As early as 1824, the Grand Jurisdiction of Kentucky affirmed that Entered Apprentice and Fellow Craft Masons had the right to vote on the acceptance and passing of candidates. Additionally, until about 1853, all Lodges within this Grand Jurisdiction were opened and conducted their routine business on the first degree of Masonry, “agreeable to ancient usage and custom” or “agreeable to ancient form and usage”. The question naturally arises as to how we now open for business on the 3rd degree and call it “ancient” in any form, based merely on the presumptions of a group vote, which was taken only 163 or so years ago, while we collectively claim that Masonry has existed since time immemorial. 5 History of Freemasonry in Kentucky, Rob Morris, 1859. 6 Morgan: The Scandal That Shook Freemasonry, Stephen DaFoe, Cornerstone Book Publishers, 2014. Brothers of Elvin E. Helms No. 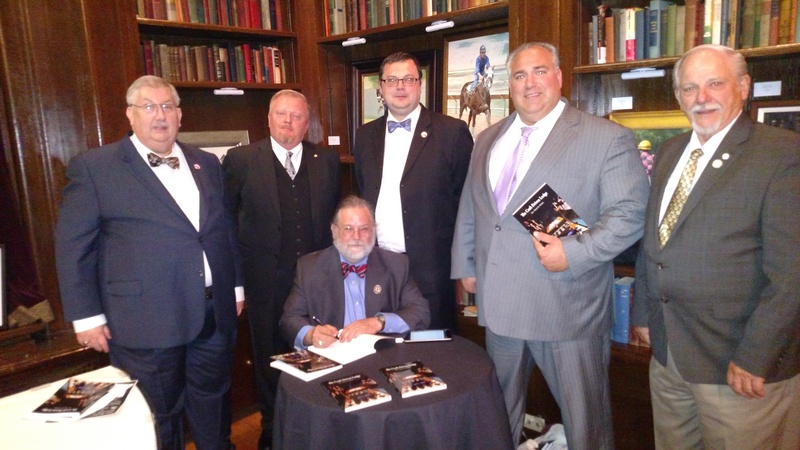 926 once again joined the Brothers and guests of the Rubicon Masonic Society at Spindletop Hall in Lexington, KY. The speaker for this evening’s festivities was Worshipful Brother Dan Hrinko, author of The Craft Driven Lodge. His book outlines the roadmap to building better Lodges and, in particular, the how’s and why’s and what did and didn’t work when the Brothers of Arts & Sciences No. 792, Grand Lodge of Ohio, set about forming their Lodge. The book gets right to the point and will leave you with a lengthy list of great ideas to improve the experience for the Brothers of your Lodge, new and old alike. Worshipful Brother Dan Kemble obtained an autographed copy of The Craft Driven Lodge for the Brothers of Elvin E. Helms No. 926. It will be available in the Lodge library. Pictured above, left to right: Dan Kemble, District Deputy Grand Master, District 18, Grand Lodge of Kentucky; Eddie Hazelett, Master of Ted Adams Lodge of Research No. 998; Dan Hrinko, First Worshipful Master of Arts & Sciences No. 792; Adam Gross, Senior Deacon; David Cassesa, Honorary Member; Ed Tanner, Secretary; Worshipful Brothers all. Below is a copy of the program presented this evening, used with the permission of Worshipful Brother Hrinko. Enjoy! Imagine the most moving, powerful and enlightening Masonic meeting you have ever experienced. What would be elements of The Perfect Lodge Meeting, that Lodge meeting you wouldn’t want to miss? What would happen before the Lodge opens that would contribute to a sense of brotherhood and preparation for the meeting to be conducted? How would the opening ceremony contribute to the Lodge experience? How about the administrative portion of the meeting? How would the minutes be handled? How would the bills be handled? How would decisions being made about social activities, charitable activities, and upcoming events of the Lodge? How would introductions be handled? How would visitors be welcomed into the Lodge? How would new brothers be welcomed into the Lodge? How would entered apprentices and fellow crafts be welcomed into the Lodge? How would the educational components of the meeting be presented? What would happen on a night when ritual was being presented? 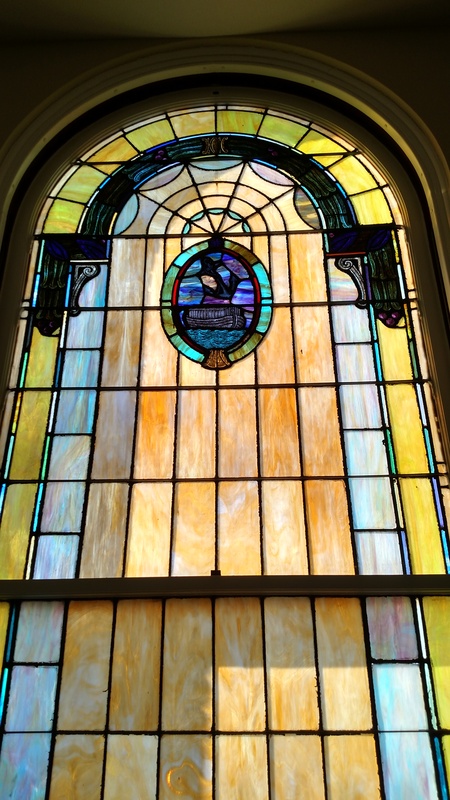 What would happen after the closing of the Lodge to add to the fraternal experience? Which of these options would you like to see in your Lodge during your next meeting…..the upcoming year…..in future years? 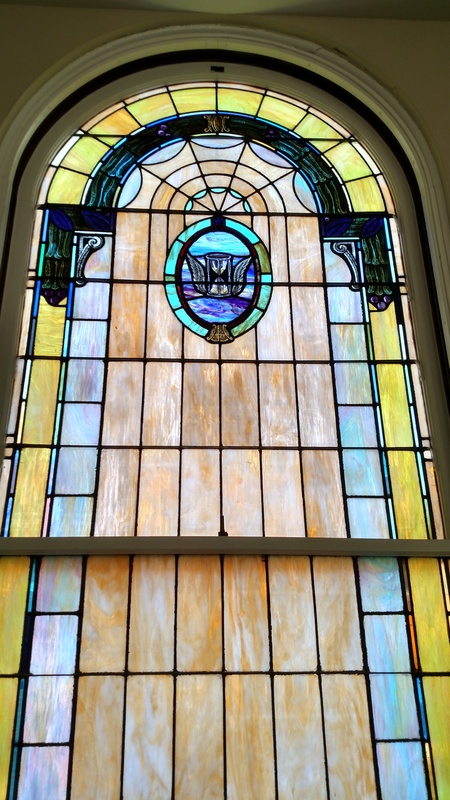 The purpose of a Lodge: Our operative ancestors created Lodges to fulfill a critical function. That function was to perpetuate the trade through identifying qualified candidates, training them in the skills needed to perpetuate the trade, and to prepare them to replace those currently working to complete the projects underway which would last decades, and to have the skilled workers available to initiate projects over the upcoming years. Social, charitable, and other elements were and are completely secondary to the primary purpose. Imagine what would have happened if the operative lodges lost sight of their primary purposes? What would those lodges have looked like? What would the future hold for such lodges? Speculative Lodges were and are no different. We exist, primarily, to identify qualified candidates, train them in the skills needed to perpetuate the work of Speculative Freemasonry, and to prepare them to replace those currently working in the Lodges. Social, charitable, and other elements were and are secondary to this primary purpose. Should speculative lodges lose sight of their primary purpose, it would mean we would degenerate into a simple charitable and social organization no different than and no better than other social clubs or charitable organizations. 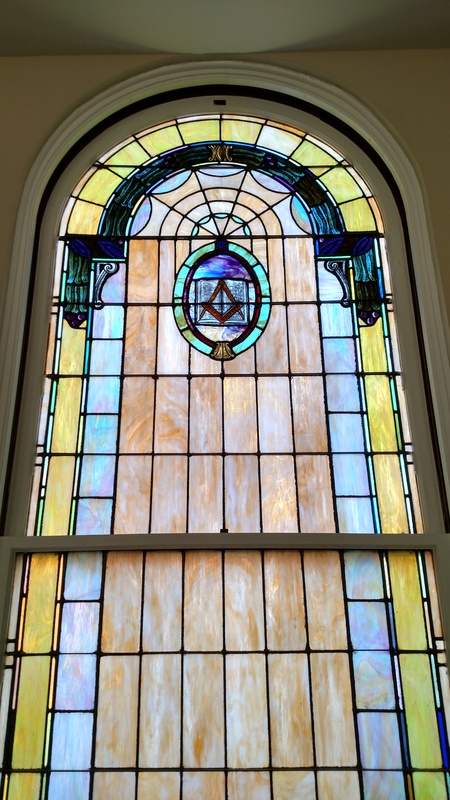 The Craft Driven Lodge: The Craft Driven Lodge is based on the work of a group of Brothers in central Ohio who sought a more meaningful Masonic experience than typical meetings that focused on administration, limited education, and perfunctory ritual work. They wanted more than to merely make members, but to truly “make Masons” as we are instructed in our charters. They created Arts & Sciences Lodge starting with a clean sheet engaging in discussions much like the one you just experienced. We specified what we wanted from our Masonic experiences and explored the possibilities on how we could accomplish that. To that end, we began exploring Masonic practices around the globe and across time. We read old texts seeking insight in to the practices of Freemasonry by our forefathers. In fine, we looked for the best way we could find to create that Sacred Space for the study of Freemasonry, the philosophy, to enhance the skills of our current Brothers, and to train the next generation of Speculative Freemasons. Fundamental Principles of the Craft Driven Lodge: “Give a man a fish and he eats for a day. Teach him to fish and he eats for a lifetime.” We can interpret it thus: Give a Lodge a list of things to do and they have several interesting meetings. Teach a Lodge to work together to make great experiences, and you will transform the Lodge for eternity. The Craft Driven Lodge is not a set of prescribed steps or actions that will result in a Lodge that works better. Although such a list can easily be produced and followed without question, and such a Lodge will experience brief success, it is far more important to teach Brothers how to create their own Lodge experiences and develop their own skills to perpetuate the Masonic experience that meets the needs and expectations of the Brothers in the Lodge. This creates a flexible system that accounts for evolution in the membership of the Lodge, changes in society, and the preferences of those who participate in the Lodge. By following these principles, you will form a core society of friends and Brothers who can work together to form a Lodge that is enlightening, rewarding, and fulfilling. These are the principles that we followed during the formation and operation of Arts & Sciences Lodge. The leaders let the workers work. Everyone has a Voice: This begins by creating places for every interested Brother to participate in conversations about what the Lodge is, could be, and should be. This includes officer meetings, informal discussions, personal conversations, and “open forums.” When conducting such discussions, it is wise to use open ended questions, those that cannot be answered with a simple yes or no, not closed ended ones. This process should include a clear understanding of the primary purposes of speculative lodges. Recognize that engaging in a discussion is a skill that many have not yet developed. Also recognize that Freemasonry has gone to great lengths to create sheep. We are taught to defer to the powers that be, wait our turn, and then implement our ideas when we are in the “East” whether they are good or not, whether they are supported or not, or even if they can be implemented with any success. 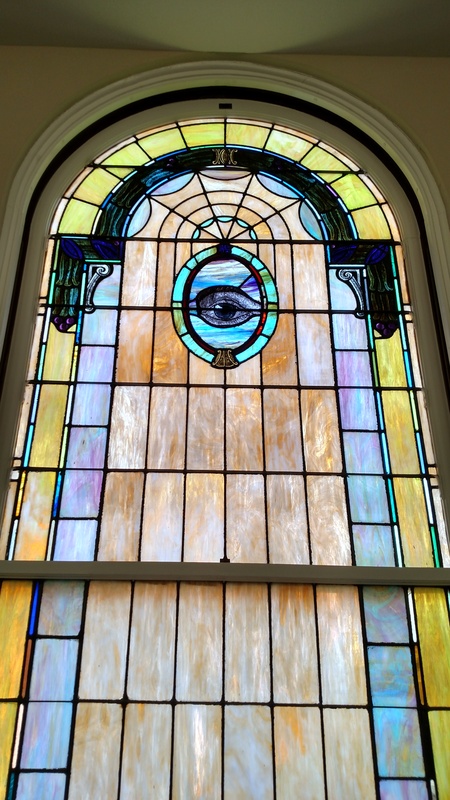 Everyone sees the vision: Lodges should develop some consensus as to what their purpose is, the nature of the experiences they are seeking, and communicating what the conversations have revealed about what the Brothers want from their Masonic Experiences. This vision becomes the goal that is pursued using the road map of planning and thorough implementation. Everyone has a job: Lodges should create opportunities for every Brother to be an important contributor to the life and success of the Lodge. This can include having brothers server as officers, presenting lectures as a team, using teams of Master Craftsmen to train new Brothers in the catechism AND the meanings behind it, “Ambassadors”, activity coordinators, etc. If you have a skill, you should seek a way to have that skill benefit the Lodge. Once you have found your place and you have your job, you will be missed if you do not attend. We need to avoid having only 2 classes of Brothers; officers who do everything and Brothers who do nothing. Leaders let the workers work: Our Fraternity is structured in the form of a feudal society where we endow our leaders with unquestioned, near absolute power. This is based on the belief that, if guided by the principles of our Order, they will do so in a caring and benevolent manner. This will succeed if they actually know the principles of our order and if they have sufficiently circumscribed their passions for power to see themselves as servants of the craft. For a moment let us envision the Master of the Lodge as the CEO of a company. The craft in the room are the customers giving feedback about their Masonic experiences which is the product of the company. They are also the labor force required to produce this product, and they are the board of directors telling the CEO what they want this company to do and the direction it should be going. Therefore, it becomes the responsibility of the Master to exercise his authority as a servant of the Craft keeping in mind that he will not be successful unless he meets the demands of his customers, keeps his labor force satisfied so they will work for him and move the company in the directions that the Board desires. He needs to listen, plan, communicate, delegate, monitor, and not micro-manage. The Purpose of Freemasonry: We see the purpose of Freemasonry as forging strong bonds between Brothers and Lodges. This leads to learning the lessons of Speculative Freemasonry, understanding them on a personal level, and practicing them in the world at large. Transforming the ordinary good man into the extraordinary Mason requires this process to be seen as a never ending responsibility and relentlessly pursued by everyone involved. Basic education is not sufficient to truly transform the man. We do this through a variety of activities. Think about it. If all you know about your Brothers is what is experienced between the opening and closing of the Lodge that is an important but very limited slice of information. Activities other than tyled meetings such as dinners, family activities, social events, and conversations about our mutual curiosity are chances for an honest presentation of who we are. Enquirers to Arts & Sciences are invited to join us for dinners, social events, and at other times. This is time for them to learn about us and to learn about what to expect and will be expected of him should he join. It also provides an opportunity to learn about what he is seeking, what he expects from Freemasonry, and to determine if this will likely be a mutually beneficial experience. We have chosen discussions as the primary means of education. We use a variation on the Socratic Method. For more on this style of discussion and education, feel free to refer to the book “The Socrates Cafe.” We also have times when we invite our family, enquirers, and other guests to join us in appropriate discussions. We often choose topics that explore the symbolism and lessons contained within the ritual and the related lectures. We announce our topics in advance to allow Brothers to consider what they know, explore outside resources, and to form questions that they have about the topic. We make use of featured speakers with discussions that follow which are related to the topic presented by the speaker. We often pair our discussions with the degree being exemplified on those nights when we are doing ritual work. Imagine finishing the Entered Apprentice Degree and following the charge with an open discussion about what it means to have a duty to God, our neighbors, and ourselves. This topic of “applied Freemasonry” completes the sequence needed to be transformative which is present, understand, and apply a concept. Excellence in ritual: Our ritual is the first and most important way to have of introducing men to the principles and lessons offered in Speculative Freemasonry. The quality of our work directly reflects the importance we place on what is being presented. How can we expect a candidate to take this seriously if we do not? How can we encourage them to invest their time in learning and exploring Freemasonry if we do not do so ourselves? We recognize that we cannot properly present that which we do not understand. We can learn phonetically, present accurately, and still have no idea what we just said. This has been referred to in the past as being “parrot Masons.” Therefore, it is clear to use that the learning of the ritual to present it in a satisfactory manner must also be the study of the symbols, lessons, and the exploration of the applications of those lessons in our daily lives. This understanding will form the foundation of our understanding of the ritual and translate into excellence in our ritual and the likelihood of creating the proper impression on our candidates. Training of Candidates: Proper training requires effort and persistence. We begin the formal training of our Brothers before they even receive their Entered Apprentice Degree. They participate in the School of the Profane where applicants who have passed the ballot participate in 3 to 4 meetings. During these meetings they discuss symbolism as a means of teaching, review King Solomon’s Temple as a historical setting, and discuss philosophical topics brought up in Plato’s Allegory of the Cave. These are presented in a discussion format that also prepares the candidate for our preferred method of teaching. Following his initiation, he is assigned of team of mentors or Master Craftsmen who are responsible for his training in the catechism and review Carl Claudy’s book “Introduction to Freemasonry” and to review the ritual and lecture of the degree. All Entered Apprentices meet with the Junior Warden in a Lodge of Instruction on the Entered Apprentice Degree to discuss their thoughts, experiences, and to answer questions from the readings they have pursued. With weekly meetings of 1 to 2 hours, it will take 4 to 5 months to become minimally proficient as an Entered Apprentice. Each brother follows the same process after passing to the degree of Fellowcraft and again after their being raised a Master Mason. Why is this needed? Stagnation in Freemasonry is a constant challenge. To merely repeat what has been done before us is easy and appealing to many. Particularly those who are insufficiently prepared for the opportunities and responsibilities associated with effectively presiding over a lodge. As society evolves and new members join our ranks, a fresh approach to the timeless principles of Freemasonry is needed to assist us in keeping up with the evolution of mankind. The truths of Freemasonry are universal and forever applicable to improving men and the societies in which we live. Our tenets, ceremonies, and specific elements of our ritual should remain unchanged as well as teaching through symbols and retaining our connection with our Masonic ancestors is critical to our long term stability. However, the interactions between man, Lodge, and society needs to evolve for Freemasonry to remain a vibrant and effective force in our lives and our community. To disconnect from the world around us in the name of “Tradition” risks moving Freemasonry into the realm of becoming irrelevant to man and to society making the power of our lessons ineffective. “Regrettably, some Lodges are ruled by a small clique of senior brethren who impose their will on the majority in a variety of ways. Unquestionably, these brethren are passionate about their Freemasonry and are highly respected by the brethren. They have worked steadfastly for the Craft over the years and earned all that they have achieved — but are unable to move on, and accept that the world is changing at an alarming rate, and Freemasonry must move with it. In consequence, often with the very best of intentions, they are stifling the development of their Lodges. All brethren are entitled to their view; and to express their view; but none have the right to impose that view on a Lodge.” -Brother Michael J. Wilks, Provincial Grand Master of Hampshire and Isle of Wight, during his address to the Provincial Annual General Meeting, July 2014. Guidelines for implementation: Begin with informal meetings to discuss what people think about their current Masonic experiences and to explore what they really like about and want from Freemasonry. Explore what they may want to see more of as well as what they see as a poor use of time. 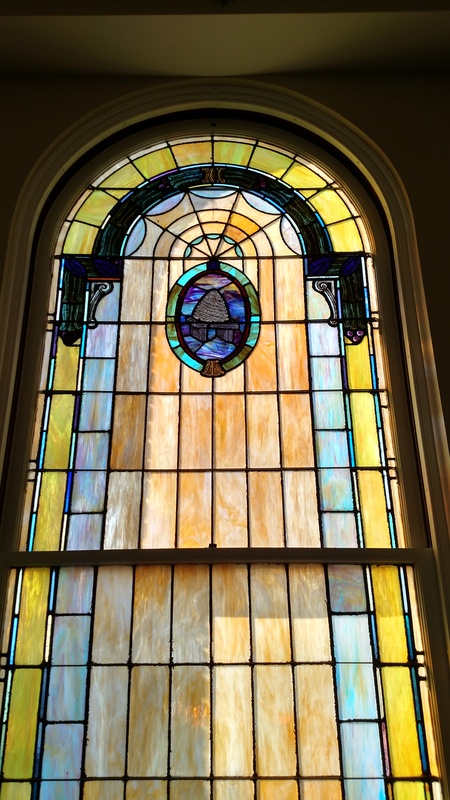 Past practices should be questioned to see if they are relevant to the brothers in Lodge. These discussions will likely yield several themes that seem to appear across the country. They are more education, better degree work, quality fellowship activities, less administration, and more family activities and involvement. As your Lodge develops its own ideas about what should stay and what should go, expectations about what needs to change should be developed as well as a list of specific challenges and goals. Priorities need to be set and detailed plans developed to take action. Remember, a goal without a plan is merely a wish. Be careful of the pace of change as evolution may be slow but it is better that alienating may due to a revolution. Pick three things to do. Implement them based on a thorough and detailed plan of actions and leave enough time to see the effects. Hold more discussions about the changes, choose three more, and then repeat the cycle. 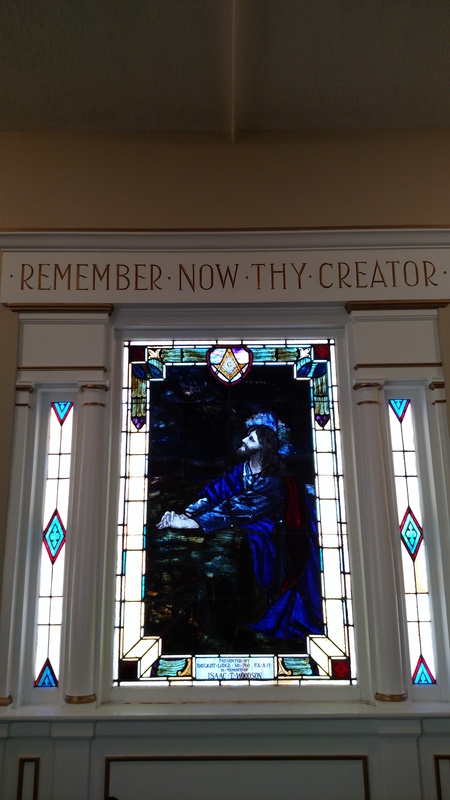 As you consider the ways your Lodge can evolve and the ways to create better Masonic experiences in your Lodge, keep the principles of the Craft Driven Lodge in the forefront of your thinking to assure that you are attentive to and meeting the needs of the Craft that makes your Lodge possible. “The Craft Driven Lodge” is published by Macoy Masonic Publishers of Richmond, Virginia and is available through their website www.macoy.com. For more information about The Craft Driven Lodge, you can follow us on Facebook at facebook.com/The-Craft-Driven-Lodge. Additional essays and presentations by the author are available at www.craftdrivenlodge.com. About the Speaker: Brother Daniel D. Hrinko was born and raised in Springfield, Ohio. His father was a member of Clark Lodge No. 101 and his maternal grandfather, Benjamin Harrison Wallace, was a member of Yellow Springs No. 421. He graduated from Northwestern High School in 1973 after 3 years of study and attended Muskingum University receiving a Bachelor of Arts in Political Science (pre-law) and Psychology in 1976. He attended Ball State University receiving a Master of Arts in Psychology in November 1977 at the age of 21. After working for several social service agencies, he returned to school in 1989 receiving a Doctor of Professional Psychology in 1995 from the Wright State School of Professional Psychology. Since receiving his Doctorate, he has been in private practice focusing on Forensic Psychology performing evaluations to assist the Courts in making decisions regarding the impact mental health problems have on criminal and civil matters. Brother Hrinko lives in Springfield, Ohio with his wife Lisa. They were married in 1976 and have two children. Lisa obtained her Bachelor of Arts from Muskingum University in 1976 and a Master of Arts in Special Education from the University of Dayton in 1990. She has retired from a 30-year career teaching pre-school children who suffered from multiple handicaps. They live in the home built by Daniel’s father where Daniel was raised and where they raised their children. They both enjoy time with their grandchildren. Brother Daniel D. Hrinko was initiated January 1977, passed March 1977, and raised April 1977 in Clark Lodge No. 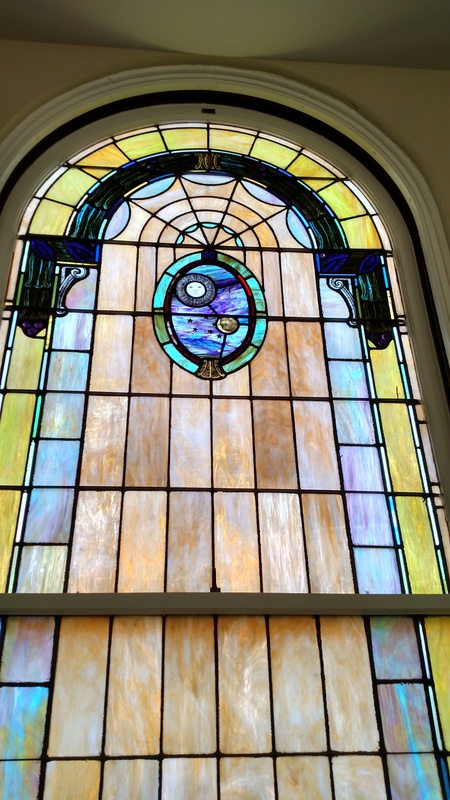 101 Springfield, Ohio, Grand Lodge of Ohio. 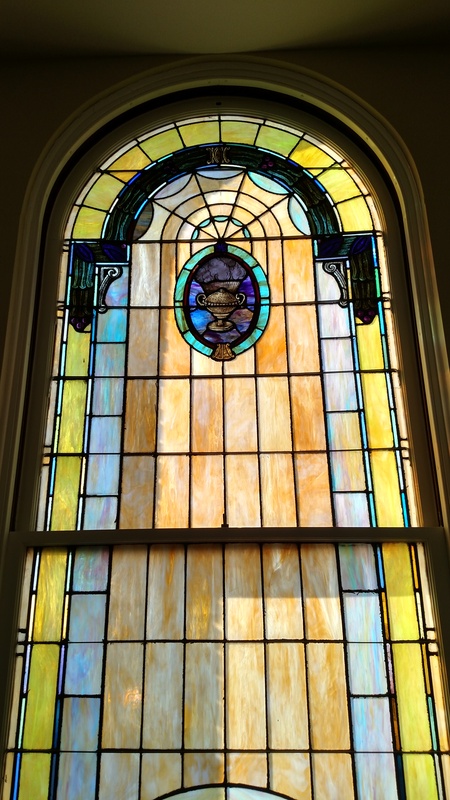 He served as Worshipful Master of Clark Lodge No. 101 in 1982-1983, and again in 2004-2005. He was the Worshipful Master of Arts & Sciences Lodge Under Dispensation in 2009-2010 and served as the Charter Master of Arts & Sciences No. 792 in 2010-2011. He has served on the Grand Lodge of Ohio Committee on Education and Information from 2007 through 2014 and served as a District Education Officer in 2013 and 2014. He currently serves as District Deputy Grand Master. Four members of Elvin E. Helms No. 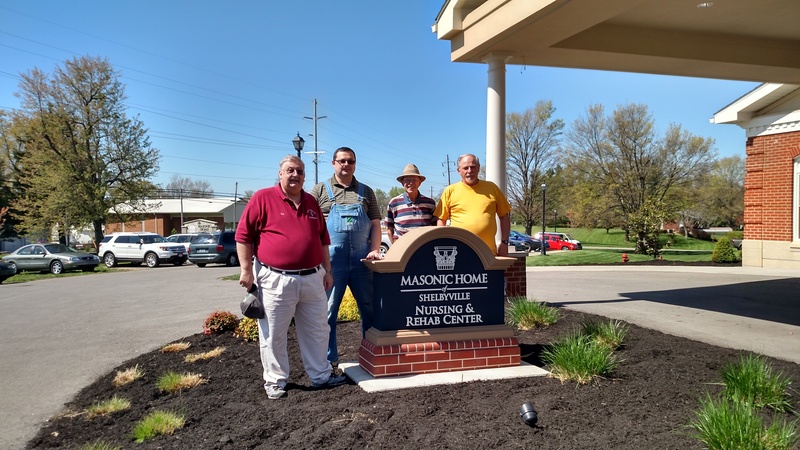 926 were among the crowd of two hundred Brother Masons and their families who came out to participate in the 2016 Great Day of Service at the Shelbyville Campus of the Masonic Homes of Kentucky. With such a large and hard working crew we made quick work of cleaning and beautifying around the campus. District 18 was well represented in Shelbyville with Brothers from Golden Rule-Covington No. 109, Colonel Clay No. 159, Boone-Union No. 304, Elvin E. Helms No. 926, William O. Ware No. 999. Pictured above, left to right: Dan Kemble, District Deputy Grand Master, District 18, Grand Lodge of Kentucky; Adam Gross, P.M., Senior Deacon; Ernie Stratton, P.M., Master; and Ed Tanner, P.M., Secretary. 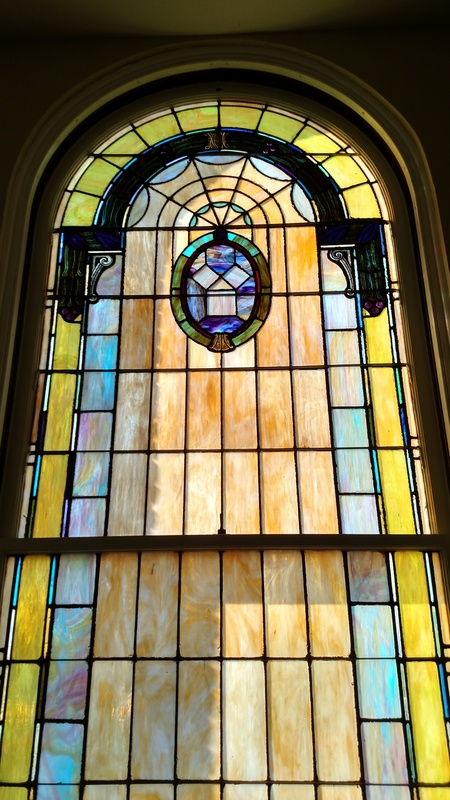 After the day’s work was completed we took the opportunity to visit the chapel and spend some time admiring its beautiful stained glass windows. Brother Kevin Schneider, P.M., Bradford No. 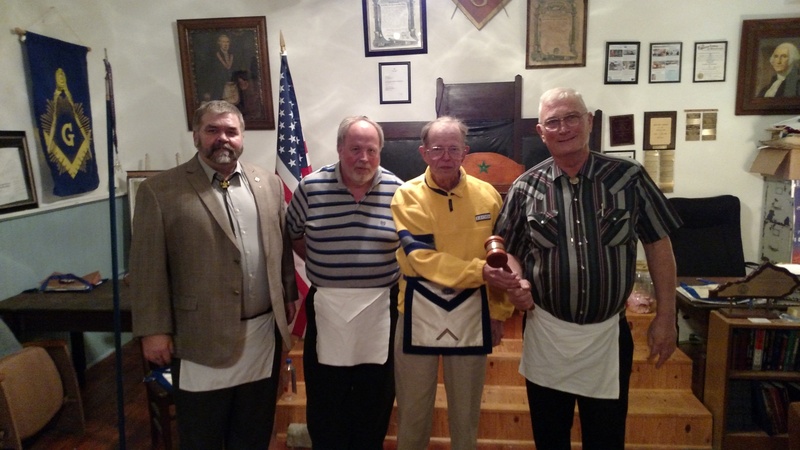 123 was the Masonic Education guest speaker at our April Stated Communication. He spoke on the subject of the return on your Masonic investment. Brother Kevin directs a Lodge of Instruction at Bradford No. 123 which meets every 3rd Thursday at 7:00pm. Pictured above, left to right: Ernie Stratton, P.M., Master, Elvin E. Helms No. 926; Kevin Schneider, P.M., Bradford No. 123. As humans we all decide where to invest (time, money, etc.) into efforts that give us an ROI (Return on Investment). Would you agree? Masonry is no different. When you joined the Fraternity what was the return that you were expecting? Was it social? Was it business benefits? Or did you believe the advertisement (Masonry makes good men better)? What are the long-term results? Does that routine help them get the return they seek?? Men are joining for the right “return.” How do we get them the ROI we seek? Let me say this: our fraternity is an act of genius. It is brilliant in its construction. There is nothing about it that is random. Everything in our ritual has a literal and symbolic meaning. Who here labors (or did)? Did you do that work by hand? You used tools. EA Degree. What are the tools? How are they meant to be used? What was the last time you made an EA use these tools? We should be. We are TOLD to do it!! But it is up to this Lodge to hold a Brother accountable for doing the work before advancing them. You now have a choice… Will you do things the same old way? Presented by Brother Kevin Schneider (Bradford No. 123). The opinions expressed here are solely those of the presenter. They are not intended to reflect any official opinion of the Grand Lodge or of any subordinate Lodge. The Brothers of Elvin E. Helms No. 926 had a very busy night on April 12 at our Stated Communication. We were thrilled to have a lot of visitors with us this month. Three Brothers from Wilmginton No. 362 came to collect the District 18 Traveling Gavel. Pictured above, left to right: Bill Cornelius, Senior Deacon, Wilmington No. 362; Mike King, P.M., Treasurer, Wilmington No. 362; Ernie Stratton, P.M., Master, Elvin E. Helms No. 926; Dave Carnes, P.M., Master, Wilmington No. 362. 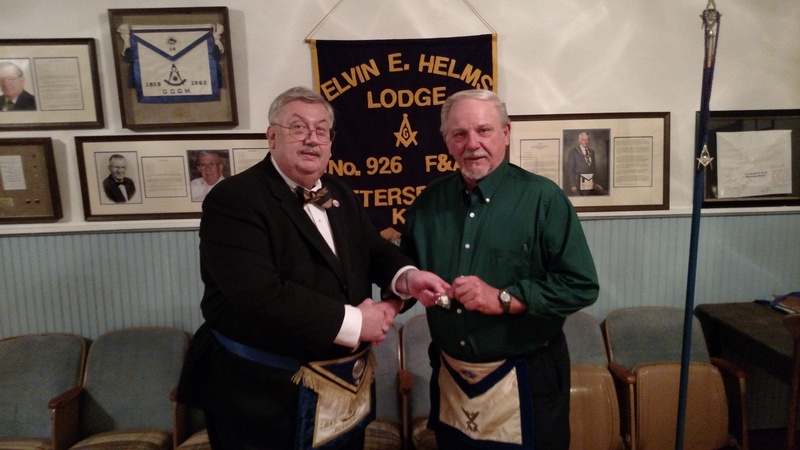 Brother Dan Kemble, P.M., and current District Deputy Grand Master, District 18, Grand Lodge of Kentucky, presented the Brothers of Elvin E. Helms No. 926 with a unique piece of Kentucky Masonic history. Most Worshipful Grand Master Cloyd J. Bumgardner used thirty of the gavels he had commissioned for his year as Grand Master during the Master Mason Degree in the Senate Chambers on All Mason’s Day in Frankfort this February. Most Worshipful Brother Cloyd presented one of these gavels to each of his District Deputies. 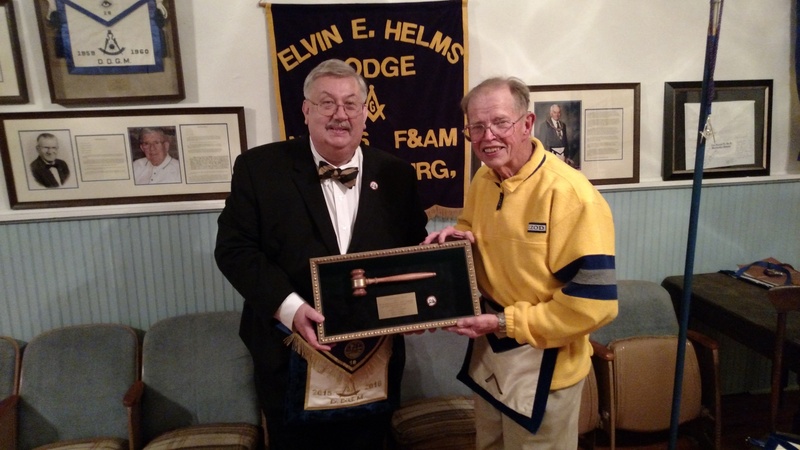 Brother Dan had the gavel with which he was presented mounted for display and gave it to Elvin E. Helms No. 926. Pictured above, left to right: Dan Kemble, P.M., District Deputy Grand Master, District 18, Grand Lodge of Kentucky; Ernie Stratton, P.M., Master. Brother Ed Tanner, P.M., Secretary, successfully completed the Grand Master’s Constitution Quiz. 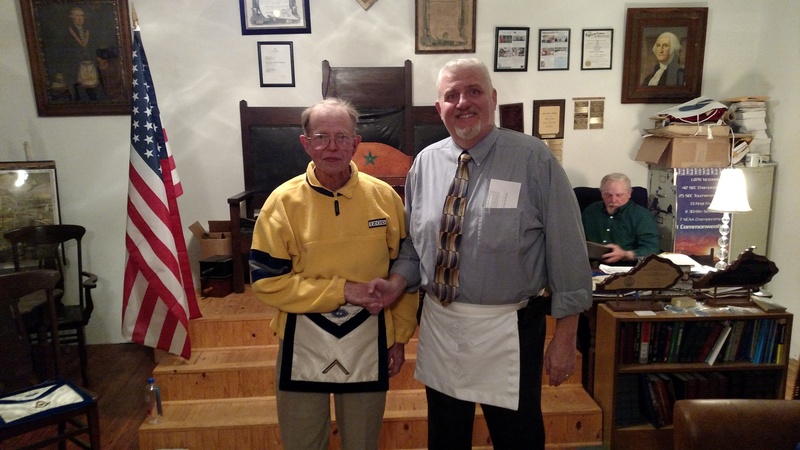 Brother Dan Kemble presented him with a Constitutional Scholar lapel pin. Congratulations Brother Ed on this significant achievement! Pictured above, left to right: Dan Kemble, P.M., District Deputy Grand Master, District 18, Grand Lodge of Kentucky; Ed Tanner, P.M., Secretary. Elvin E. Helms has adopted Masonic Homes resident Brother James Russell Ross of St. George No. 239. Brother Ross is 78 years old and his mailing address is Sam Swope Care Center, 3503 Moyers Circle, Masonic Home, KY 40041. He is in room 245 of Campbell House. Brother Ross is a Louisville native and has been a member of the fraternity since 1971. His birthday is December 23. Please add Brother Ross to your mailing list for Christmas cards and birthday cards. Be sure to visit him when you are in the Louisville area and feel free to send him other cards, letters, and gifts as the occasion arises. Please especially remember to keep Brother Ross in your prayers. Welcome, Brother Ross, to the family of Elvin E. Helms Lodge! 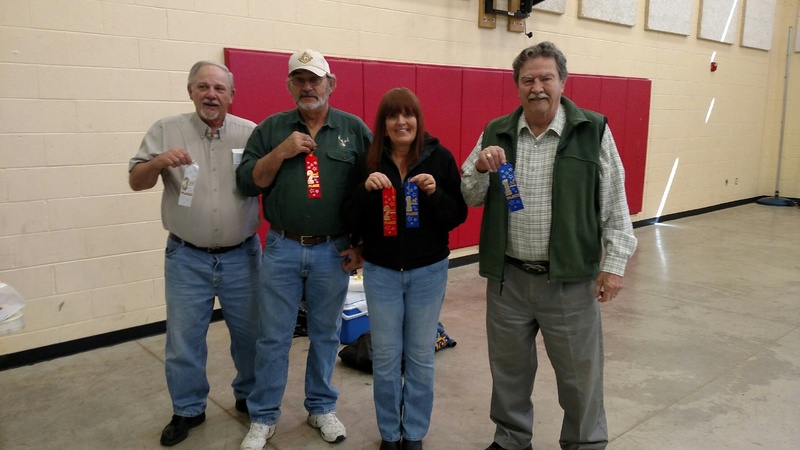 This year the David Wood Memorial Chili Cook-off had seven entries. Chili chefs included Ed Tanner, Rick Campbell, Adam Gross, Laura Rodgers, Travis Bush, Debbie Bush, and Buddy Wallace. The overall winner this year was Brother Adam Gross, receiving a total of $204 in votes. This makes Brother Adam the unofficial Mayor of Petersburg for the ensuing twelve months, or until his successor has been installed. Brother Adam also won first place in the traditional category. Second place in the traditional category was Brother Rick Campbell, while Brother Ed Tanner finished a distant third. Winners in the exotic category were Brother Travis Bush, first place, Debbie Bush, second place, and Laura Rodgers, third place. Brother Buddy Wallace finished first in the hot category. Brother Adam also won the split the pot and donated his winnings back to our Christmas Fund for Kelley Elementary School. Pictured above, left to right: Brother Ed Tanner, Brother Rick Campbell, Debbie Bush, and Brother Buddy Wallace. Thanks to all of our Brothers and friends who joined us at this year’s chili cook-off. We enjoyed a time of good food and fellowship and we look forward to next year’s cook-off. Thanks for helping make this a successful event.